Livescan Fingerprinting – Federal Fingerprinting, Inc. The latest technology. Safe and secure. The California Department of Justice (DOJ) is mandated to maintain the statewide criminal record repository for the State of California. In this capacity, sheriff, police and probation departments, district attorney offices, and courts submit arrest and corresponding disposition information. The DOJ uses this information to compile records of arrest and prosecution, known as “RAP sheets,” for individuals and disseminates the information for law enforcement and regulatory (employment and licensing) purposes. 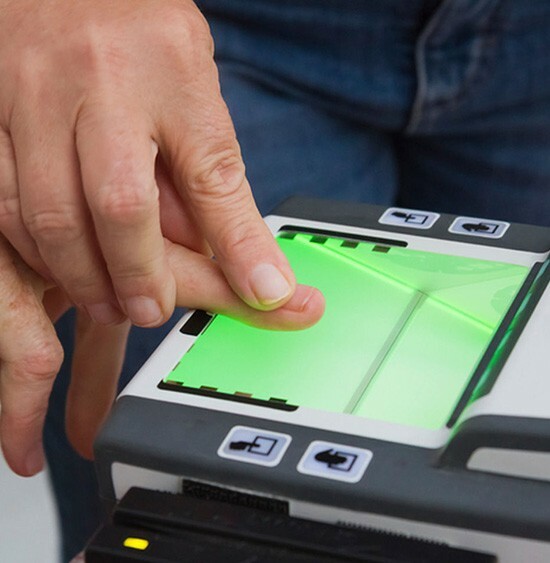 RAP sheets are based upon fingerprint submissions, and therefore positively identified biometrically; a process by which a person’s unique identity is confirmed. Authorized by California statute, the DOJ has processed State of California and Federal Bureau of Investigation (FBI) fingerprint-based background checks for decades. While all criminal background check requests must be authorized by statute, some are mandatory while others are permissive. In the past few years there has been a heightened awareness of the availability of criminal background checks to aid in regulatory hiring decisions. Consequently, the number of requests for criminal background checks continues to increase exponentially. Today there are over 45,000 agencies authorized to perform background checks. DOJ technicians process approximately 2 million state level background checks and 1.2 million federal level background checks annually. Securing a criminal background check prior to employment, licensure, or certification provides a hiring or licensing authority an important resource, which aids in the evaluation of the applicant. These applicants are often candidates for positions that place them in a position of trust for some of California’s most vulnerable citizenry, elderly, and dependent adults and children. As such, it is vital for the hiring or licensing authority to be aware of specified active arrests or convictions. Entrusting applicants with the responsibility of the position prior to a criminal background check potentially jeopardizes the safety and integrity of the workplace and may leave some individuals exposed to unnecessary harm. Employment and licensing authorities may also face legal liability if applicants with specified active arrests or convictions are employed or licensed when statute prohibits such action based on the successful completion of a criminal background check. The background check process begins when an applicant agency provides an applicant with aBCIA 8016, REQUEST FOR LIVE SCAN SERVICE form. The applicant completes the form with his/her personal information and takes the form to a live scan operator where the applicant must provide the appropriate identification. In California, fingerprinting must be performed by a certified fingerprint roller or qualified law enforcement personnel. The live scan operator checks the applicant’s identification, inputs the applicant’s personal descriptor information, captures the applicant’s fingerprints electronically, and transmits the data to the DOJ. At the conclusion of the session, the applicant should be provided an applicant transaction identifier (ATI) number, a number used to identify the transaction. The assignment of an ATI number, generated by the live scan device, does not necessarily mean the fingerprint images and personal information was submitted to the DOJ. Although the fingerprint images and personal information are to be transmitted to the DOJ within 24 hours, the actual transmission of the information to the DOJ is at the control of the live scan operator; and varies in timeliness. Once the transaction is received by the DOJ, the fingerprint images are used to automatically search against all other fingerprint images in the fingerprint database. If there are no fingerprints matching the applicant’s fingerprints, the transaction is generally processed electronically without technician intervention within 48 to 72 hours. If an applicant’s fingerprints match fingerprints in the database, the associated RAP sheet must be reviewed by a technician. This is a manual process that can take an indeterminate amount of time. The applicant agency is automatically sent a delay notice response. Questions or status inquiries related to a delayed transaction cannot be responded to, as there is no pertinent information that can be statutorily provided until the manual review of the transaction is complete. The next communiqué the applicant agency will receive is the completed response. A DOJ technician first reviews the RAP sheet to determine if there is a corresponding disposition for each arrest. If there is, the technician applies the dissemination criterion statutorily mandated for the applicant type, e.g., the type of employment, certification, or license, and prepares a background check response for the applicant agency pursuant to Penal Code section 11105 (k-p). The response may be sent electronically or via hard copy mail, depending on how the applicant agency requested to receive their responses. If there is not a matching disposition for every arrest, the DOJ is mandated by statute and case law to perform a “genuine effort” to determine the disposition of each arrest that does not have a corresponding disposition. To fulfill this “genuine effort,” the DOJ must contact the booking police or sheriff’s department to determine who affected the arrest, and then the arresting agency is contacted to determine if the arrest was a “release detention only” encounter. Depending on what the technician learns, the DOJ may contact the District Attorney’s office to determine if the arrest was referred for review or action and to determine if any action was taken or if the District Attorney’s office declined to prosecute on the arrest. If there is no information available from the District Attorney’s office, the DOJ will contact the court to determine if this arrest event was handled in their court and if there is a disposition of that arrest event. The probation department may also be contacted to gather any missing information. Each contact is accomplished via telephone call or fax request. The research is labor intensive on the part of these agencies contacted, and as such, sometimes they limit the number of information requests the DOJ may make to them each day. Once the “genuine effort” is fulfilled, the criminal history record is updated, the RAP sheet is reviewed again, the dissemination criterion applied, and the background check response is prepared and sent to the applicant agency. Agencies authorized to submit fingerprints and receive FBI identification records must provide written notification to the individuals fingerprinted that the fingerprints will be used to check the criminal history records of the FBI. The officials making the determination of suitability for licensing or employment shall provide the applicants the opportunity to complete, or challenge the accuracy of, the information contained in the FBI identification record. These officials must also advise the applicants that procedures for obtaining a change, correction, or updating of an FBI identification record are set forth in Title 28, C.F.R., § 16.34. Officials making such determinations should not deny the license or employment based on information in the record until the applicant has been afforded a reasonable time to correct or complete the record, or has declined to do so. In addition to fingerprints matching CORI in the criminal history database, delays can be caused for a variety of other reasons; some of which occur before the transaction ever reaches the DOJ. For example, poor fingerprint quality or incorrect data in the electronic transaction can cause a delay. Poor fingerprint quality means the fingerprint image is not as clear as it should be, which impacts the system’s ability to confirm or dismiss a potential fingerprint match. When the ambiguity is identified, the potential match or matches must be manually (visually) compared and verified before the transaction can be processed. It is also entirely possible that fingerprints accepted by the DOJ system could be rejected by the FBI, because the FBI uses a higher threshold (sensitivity when comparing one print to another) to define a match. Incorrect data entries can be prevented by making sure the live scan operator has entered all the information provided on the BCIA 8016, REQUEST FOR LIVE SCAN SERVICE and that the information has been entered correctly. The applicant agency must also ensure they have provided complete and accurate information, specifically the applicant agency ORI (a unique code assigned by the DOJ), the name of the agency authorized to receive the CORI, mail code (a five-digit code assigned by the DOJ), the authorized type of applicant, and a description of the type of license, certification, or permit; also referred to as the working title of the applicant. If the description of the type of license, certification, or permit was assigned by the DOJ, it mustbe included in the submission exactly as it was assigned. If the “level of service” indicated on the form is “FBI”, the FBI may use the description to verify the agency is authorized to receive a background check response from them. If the FBI cannot verify the type of employment, license, certification, or permit (working title) transmitted to them, they will reject the transaction for confirmation and/or clarification. If this happens, the applicant must be fingerprinted a second time so the transaction can be resubmitted to the FBI by the DOJ. If the designated mail code is incorrect, the background check results will be sent to the incorrect agency; therefore, not received by the applicant agency. If the mail code is omitted, the background check results will be sent via hard copy mail to the applicant agency. Fingerprint images can be rejected by the DOJ and/or the FBI. Fingerprints that are rejected twice by the DOJ due to poor print quality will be processed by the DOJ using the applicant’s name to check the criminal history database for any existing criminal history. If an applicant’s fingerprints are rejected twice by the FBI due to poor print quality, the form BCIA 8020, REQUEST FOR APPLICANT NAME CHECK BY THE FEDERAL BUREAU OF INVESTIGATION (FBI) must be submitted to the DOJ’s FBI Response Unit by the applicant agency, to request a name check of the FBI national criminal history database. The FBI name check request must be received by the DOJ within 75 calendar days of the second rejection notice or the applicant will need to be reprinted. This allows the DOJ to process the request for the FBI name check and forward it to the FBI within the required 90 days. After 90 days, the FBI deletes the fingerprint background check transactions and considers the FBI background check request complete. The applicant has to be fingerprinted again, which starts the FBI fingerprint background check process over. RECORD REVIEW AFTER RECEIVING A COPY OF YOUR BACKGROUND CHECK RESPONSE: If you, the applicant, wants to discuss your criminal history with a DOJ technician, you must first request a record review and obtain a copy of your criminal history record. This step is required because the background check results will only contain portions of your criminal history record the DOJ is authorized to release. The copy of your criminal history record you receive as a result of a record review will contain all the information on your criminal history record. The fingerprint-based record review copy of your criminal history record also protects you and ensures only rightful access to your criminal history. The results of background checks are sent to the agency (the agency who requested the criminal background check,) except where statutorily mandated. There are very few instances where statute mandates a second copy of the response be sent to another agency when certain conditions exist. For example, pursuant to Health and Safety Code 1522 if there is no matching fingerprint in the criminal history database a copy of the background check results is also sent to the community care licensing facility, foster family home, or a certified family home of a licensed foster family agency. The community care licensing facility, foster family home, or a certified family home of a licensed foster family agency is not considered an authorized applicant agency, such as the Department of Social Services is, and therefore, isnot statutorily authorized to receive the results of a background check containing criminal history.